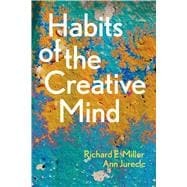 Habits of the Creative Mind is not another textbook. Instead, Habits of the Creative Mind is a series of guideposts taking your students off the beaten path of five paragraph essays and rote responses. Portable and flexibly arranged, it works beautifully alone or as a supplement to other materials. In this refreshingly conversational volume, your students will learn to trust and refine their own thinking and improve their writing—at all skill levels. They will have access to Richard E. Miller’s and Ann Jurecic’s much acclaimed, truly unique approach to posing and exploring questions, and facing complexity—in which there are no limits to how far a student may go with his or her thinking and writing. Instantly accessible and instantly flexible, all your students need to do is dive in anywhere in the book and be ready to try something new. And throughout, they will benefit from innovative, manageable exercises—which may be completed in any order—to help them along the way. In the Framework for Success in Postsecondary Writing, the Council for Writing Program Administrators, the National Council of Teachers of English, and the National Writing Project all affirm the need to shift the emphasis in writing instruction to habits of mind. This book answers that call—and gives your students the tools they need to rise to the occasion. Richard E. Miller has written and lectured extensively on how digital technology is transforming higher education. He is an award-winning teacher, an avid blogger, an amateur graphic novelist, and a poet. Ann Jurecic is the author of Illness as Narrative, which examines how writers, both literary and amateur, have used writing to make meaning of illness, loss, and impermanence. Her academic work explores the intersection of writing studies, literary studies, and the medical humanities. Jurecic is also an award-winning teacher and she writes a column for the medical journal The Lancet. Richard E. Miller and Ann Jurecic teach at Rutgers University.